The National Center for Performing Arts (NCPA) is a multi-venue, multi-purpose cultural center in Mumbai, India, which aims to promote and preserve India’s heritage of Music, dance, theater, film, literature, and photography. It also presents new and innovative work in the performing arts field. Sixteen students from grade 8 have sung two beautiful songs in this prestigious theater. The program was attended by the CEO of CITI bank and many other dignitaries. 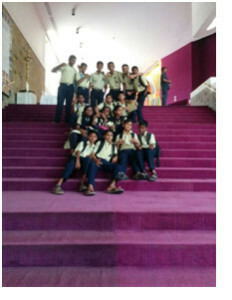 The performance was even attended by the other 11 students from 8th standard. 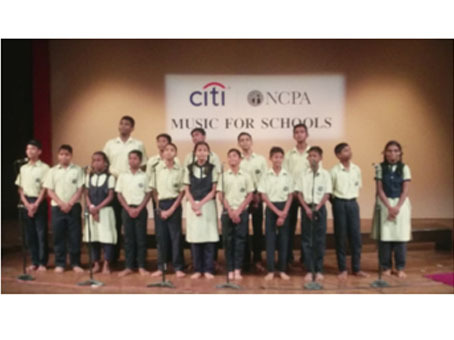 Music for Schools was an initiative started by NCPA in collaboration with CITI bank. They realized the importance of art in an individual’s life and planned to restore that by teaching music and other art forms to kids. In this program, they enrolled schools with low income and started teaching them music and other forms of arts. This is the third year in a row the kids performed in NCPA.